I tried calling this morning and the automated phone system tells me the computer is “down.” WTF?! I’m hoping this is somehow related to the positive changes at the Agency for Workforce Innovation. To handle a huge influx of calls over the last 18 months, the state is outsourcing some work to an Orlando call center. Hopefully, I say. Because if the state’s unemployment benefits computer database crashed, we’re going to have some angry, broke people in the streets. Including me. If anybody has some clues as to what’s going on, please comment below. Happen to me today, I just tried to login and do my other claim one went thru then the system crash. After login it said no more weeks to claim so i hope it went thru. 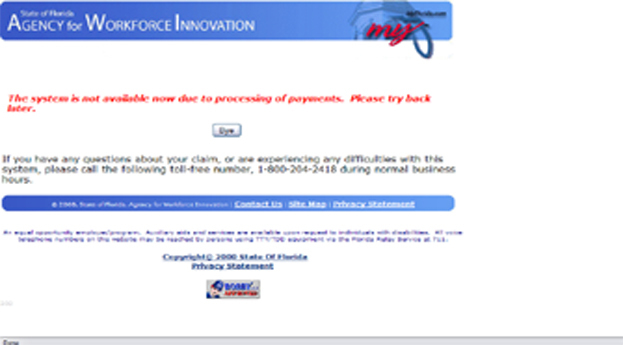 I found this site on the internet, comment funny about to the positive changes at the Agency for Workforce Innovation. To handle a huge influx of calls over the last 18 months. I login to the claim weeks website. It takes 4 min to load each page. After 30 min I get to the last page. Then I click submit and, pow, error. I get to start all over. If this keeps up I wont have time for job interviews. It eventually came through, luckily … but just looking at the comments on this obscure blog of people experiencing the same thing lets me know something is not working properly . . .